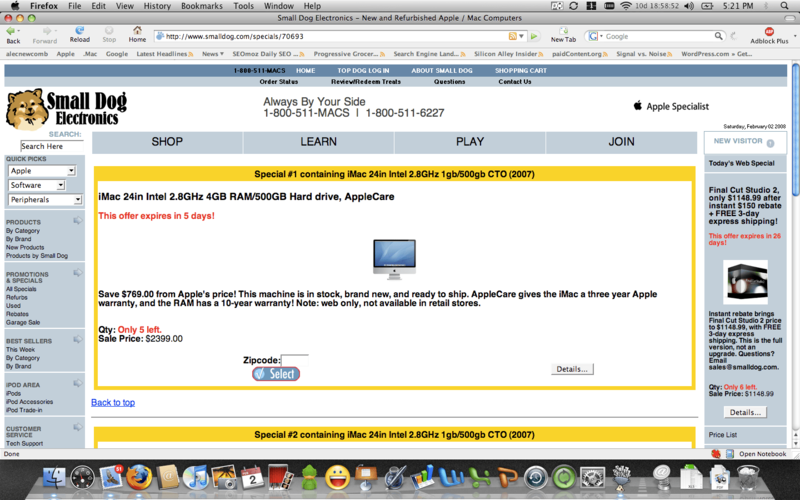 Today I went and tried to buy a 24″ Imac at Small Dog Electronics in South Burlington. I wanted to buy a 24″ Imac plus office 2008 and went onto the site to check their inventory and there were 5 left when I left my house. David a young sales associate was kind enough to help me. I had notice when I got to the store that the 24″ Imac special was web only and I asked David about that. He said that was true but they could honor that in the South Burlington store as they had some of those 24″ Imac 500g models in stock. Great but I would have bought it anyway. He made it clear that the support guys had headed home and that the extra memory could not be added today. No worries, just let me have the memory and I’ll have my staff add it. So he went to the register to double check and ring it up. In the mean time he was the only person up front and took an order for another customer for Ipod ear phones. No worries I’ll cruise the store and look at goodies. He then called me over and said sorry that in the time we had been talking you had sold out of the units on special. What? I said thanks I’d buy my unit at Apple. Why? He lied. They have 5 left. I saw it on the screen as he was talking to me. I’ve included the screen shot that I took when I got home. Business is built on trust and not lies. Maybe he did not have one in the store and the unit he brought to the front was the wrong one? Fair enough ship it from Waitsfield and I’ll pick it up. Maybe he made a mistake and could not honor the web special? Ok fess up to a mistake and I would have walked out with the one at his feet. This has been my second bad run it with the South Burlington location and it got me so fired up I dropped and email to the owner which is very unlike me. I’ll let you know if anything comes of it. UPDATE: At 6:59 pm I got a call from David apologizing for the error. He got home and saw my email and called. Kudos to him. I said I would swing in and buy the mac in the AM.